As we left the doctors office, I slipped my hand inside my husbands. He is such an incredible man, my rock. No matter what news we're given, he always resounds with a hand squeeze and "it will all be okay babe". This visit was no different...chronic pain, nodules, testing, pain clinics...he still found the right words to comfort me. It had been a rough day, no doubt. But with him by my side, laughter in the air and a 4 hour drive ahead of us it was deemed a date day! And we all know a date day isn't complete without going out to dinner. He pulled into one of my favorite restaurants. As we started walking towards the door, I again slipped my hand inside his. Time with him can turn any day around. We were seated in a semi-private area. Nearby I noticed a meeting going on with the restaurant managers. One voice consistently stood out above the rest of them. I tried to tune it out but the repeated sass and demeaning tone was rather obnoxious. We did our best to ignore it and just enjoy our time together. When we stood to leave, Joe dropped a pen on the floor. He's been having back/hip issues so I hurried to pick it up for him. When I bent over, the obnoxious voice behind me erupted with the most ridiculous laughter. When I turned to look, she covered her face and laughed so hard and loud, completely embarrassing everyone at the table. Her point of laughter? Me. Why? Why did she laugh? Why? Why did she feel that was appropriate? Why didn't the others stop her? Why was she so blatant? Why didn't she care? If she had known the day I just had, would she still have laughed? Question after question replayed in my mind. Oh kindness, so powerful yet so underused. In today's society, it's so easy to come in contact with someone who is unkind. The person at the mall you hold the door open for, who walks right past you without saying thank you. The person you accidentally pulled out in front of who gives you an unkind gesture. Or the manager of a restaurant that blatantly and openly makes fun of you. We need to learn to be tenderhearted. 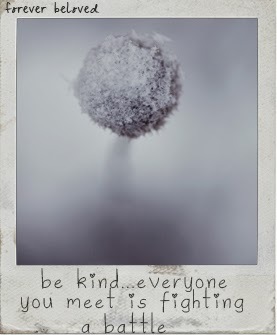 When we start being tenderhearted, it's easy to be kind. Having a heart that is easily touched and sensitive doesn't mean you’re weak. Although that's what the world would say. If we are sensitive to those around us, we start seeing their needs instead of our own. Have a loving, tenderhearted, compassionate attitude and let it shine for everyone to see. Acts of kindness don't have to be huge, expensive, flashy ordeals. Smile at someone, hold the door for them, give them the 30 cents they are searching for their McDonald's order, help them carry their bags to the car, hug them when you can see they need one, take time to talk to them and pray with them and for them. You can change lives with your actions. You can change a day with your smile. You can change lives with your kindness. You can change lives by allowing Christ's love to shine through you. You might be the one voice in their life at the moment that they need to hear. Your encouragement might be the one thing that keeps them going. Maybe you are the one who is to help them see Jesus. Your actions, words, prayers and love matter. Your kindness matters. It matters to those who receive it and it matters to Him. You might not be able to help everyone, but you can help someone.